1945-49 Studied at Govt. College of Arts & Crafts, Calcutta, he was expelled before completing his Diploma, due to his deep involvement in politics. 1953 Transferred and graduated from Govt. Institute of Arts, Dhaka. National Gallery of Modern Art, New Delhi. Gaganendra Art Gallery (Govt. of West Bengal). Jane and Kito de Boer, Dubai. Delhi Art Gallery, New Delhi. 1963 Academy of Fine Arts Award, Calcutta. 1978 Rabindra Bharati Award, Calcutta. 1978 Documentary coloured film entitled `Bijan`, made by Film Australia, Film Division of Govt. of Australia. 1995 `Abanindra Puroshkar`, Govt. of West Bengal, Calcutta. He received William Carey Award. Bijan Choudhury has worked on the imagery of Bengali poetry as it has evolved since its earliest days to the present, covering almost more than four centuries of poetical development. 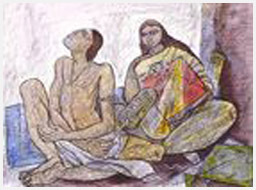 His paintings have narrative elements but are in no way illustrative. He is here both as a composer and interpreter. 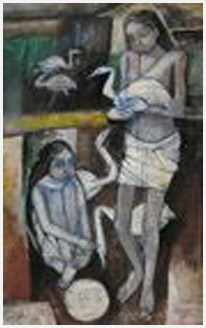 His archetypal imagery and symbolism are not explicit as in the recent Indian variety of Surrealism and fantastic art. He has always avoided the sensational and the fearful aspects of art. He has searched for significant visual forms that have behind them the range and scope of Human Art since the earliest cave dwelling days. 1976-1980 He was the Principal, Indian College of Art and Draftmanship, Calcutta.